A jury has convicted former New York Assembly Speaker Sheldon Silver of public corruption charges, dashing the 74-year-old Democrat's second attempt to avoid prison after a decades-long career as one of the most powerful politicians in state government. Andrew Siff reports. 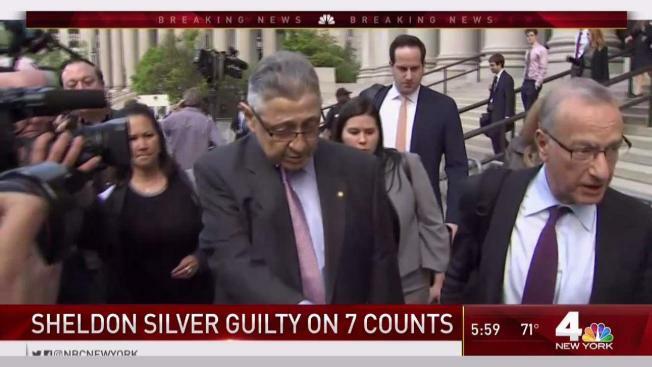 A jury convicted former New York Assembly Speaker Sheldon Silver of public corruption charges Friday, dashing the 74-year-old Democrat's second attempt to avoid years in prison after a decades-long career as one of the most powerful politicians in state government. The verdict, which came on the first full-day of deliberations, was a repeat of the outcome in Silver's first trial in 2015. That conviction and a 12-year prison sentence were tossed out by an appeals court as a result of a recent Supreme Court ruling that tweaked the legal boundaries of what constituted corruption. Silver could again be facing a long prison term when he is sentenced on June 13. 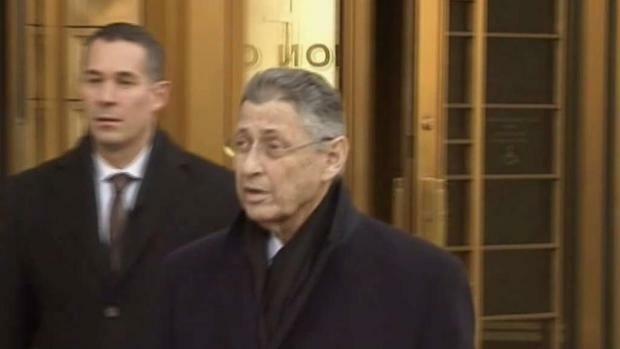 Once one of the most powerful figures in New York politics, former state Assembly speaker Sheldon Silver's second corruption trial began Monday. Silver was convicted and sentenced to prison in 2015, but that verdict was overturned on appeal. Melissa Russo reports on the opening statements in Silver's re-trial. After the verdict, Silver emerged from the courthouse and said he would launch another appeal. "I feel disappointed at this point," he said. But, he added, "I am very confident that the judicial process will play out in my favor," he said. One juror who didn't give reporters her name said the government case was too strong for Silver to overcome. Still, the decision "was difficult," she added. "Everything was difficult. I tried my best." In a statement, Democratic Gov. Andrew Cuomo said the verdict "shows no one is above the law." Prosecutors said Silver broke the law by collecting nearly $4 million in fees from a cancer researcher and real estate developers who in turn benefited from his clout in state government. He made another $1 million investing that money. Assistant U.S. Attorney Tatiana Martins had urged a conviction, saying there was a "mountain of evidence" that Silver was making millions of dollars by utilizing a form of extortion that stemmed from his enormous power over legislation during his time in office. The former New York State Assembly speaker Sheldon Silver is in federal court in Manhattan Monday where prosecutors will try to convince a second jury that he traded favors for kickbacks. Melissa Russo reports. During closing arguments, defense attorney Michael Feldberg said fees Silver received were lawful and were "common, standard and accepted" among legislators who were permitted to work other jobs. The trial was twice as fast as Silver's first trial as attorneys knew what they could draw from the 26 witnesses and the evidence that accompanied them. For a second time, Silver chose not to testify. The gray-haired, bespectacled Silver was first elected in 1976 and served as speaker for 21 years, becoming the classic Albany insider with the power to control bills and state spending singlehandedly in behind-the-scenes negotiations. Known for his often inscrutable comments and wary, phlegmatic demeanor, Silver gained the nickname "the Sphinx." The verdict came several weeks before the scheduled start of a retrial of New York's former Senate majority leader, Dean Skelos, and his son. Skelos, a Republican, also had his public corruption conviction overturned as a result of a Supreme Court ruling that reversed the public corruption conviction of former Virginia Republican Gov. Bob McDonnell. Over 30 New York state lawmakers have left office under a cloud of criminal or ethical allegations since 2000. More than a dozen have been convicted of charges including authorizing bribes to get on a ballot, diverting money meant for community programs into a campaign and skimming funds from contributions to a Little League baseball program. Cuomo has proposed changes to New York's anti-corruption laws after Silver's and Skelos' convictions. But the Republican-led Senate and Democratic Assembly are deadlocked on proposed reforms.